4 v. : ; 25 cm. Vol. 1, no. 1 (July 1939)-v. 4, no. 1 (July 1948). Issues for July 1939 to June 1942 numbered v. 1, no. 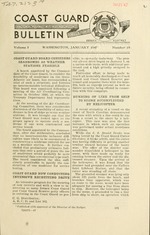 1-36; issues for July 1942-June 1945 numbered v. 2, no. 1-36; issues for July 1945-June 1948 numbered v. 3, no. 1-36. A board, appo~~inted by the Comman- the task. no insurmountable technical diffculties. fits, both as Iwon ed. meeting of the Air Coocrdlilnating Coml- tion with this campaign. Thze board appointed by the Comman- conditions. cutter was standing off shore. A, B, C, D, and List 102. I Published writh appros al of the Director of the Budget. 301.
matters connected with maritime safety. about 20 kilometers west of San Juan. auxiliary members who took part. tion of the Women's Reserve. In1 order to offset the present shocrtage? have presentedl no greater problem. Radar andc 1Loran to AD~-reh~ant Ships." ritimte Safety Laws and Regrulations." the alert and ready at any timle to note! insteadl of inlto safe channels. at Groton Tr'ainingX Stantion amrlillg De. bound consist~ has many lighthouse*, i l.
for the purpose of coast-walt(hing. peller shaft through redluction gearing. that actually given by the inspectors. with a brief description of each item. inlgton residence. H-e was 63.
watcr construction, and revetment workr. on. December 16, by L~t. Cointdr. G~uy L.
tancess of 1.3(1HII to 1. ".ilks miles was:1 noted. not effective beyond a fewr hundred miles. times of the signals1. Inasmuch as the! ity otf loran over nonpulsed systems. ;I('ju-.r men1ll, or no(t operated properly. essential to certain types of operations." ject of an addlrlrc delivered by Lt.
before the American Institute of ]Elee. the service exp~n rdrd. Exristing "Gee"
pose~1 of comprehensivet service tests. ar~d .spcific;nt ionsl for 3-em. eqruipme~nt. mairl saw no need of a 1..ne--ru;nge aid. and radar for short range. h~eld in Washington. last August. tinuedl for some time in this area. thaln a 5)-ke. allocation for this system. as a YP. XI. C. A. secretary. 193~91. As administrative assistant, Mr.
ters of law, legislation, and regulations. At Coast Guard Headquarters, Mr.
technical assistant to the chief counsel. Mr. Harman's son, Ensign Henry V.
Coast Guard A~cademy inz June 1946. Guard District, effective IMay 31, 1946. Commander Robert E. McICaffery, from. Laurel to Argo as commanding o~fficer. chant marine inspection duty, Monbile. charge fr~om Reserve due to age limit. L-t. Comdr. Arved E. WVikandler. Lt. Comdr. Benjamin B. 1Brown, UJSCGR. ZLt. Comdr. John Culver, USCG;R.
Lt. Comdlr. John N. M~cAfee, UJSCGR. L~t. Comdr. Sheldon A. Russell.